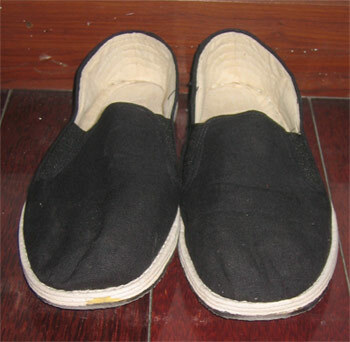 Cloth shoes are common in the streets of Chinese cities, mostly on the feet of the poorer, less cultivated segments of society, perhaps because they are cheap (mine cost 15 RMB) and functional. Many cloth shoes look quite grubby since they hold the dust and grime and appear to be seldom washed. However, quite luxurious styles also exist, especially for indoor use, costing many times the price of their plebeian cousins. There is surprisingly little information about cloth shoes on the English-language Internet. Most sites are commercial sites (often selling ‘kung fu shoes’) and Wikipedia doesn’t have a page at all. The Chinese-language Internet is better served. Chinese Wikipedia has only a few lines, but Baidu and Hudong both have very long articles proudly devoted to cloth shoes. Despite being very comfortable to wear, my cloth shoes fit somewhat less comfortably with my notional status as an inhabitant of the outskirts of the Mongol city of Khanbaliq. 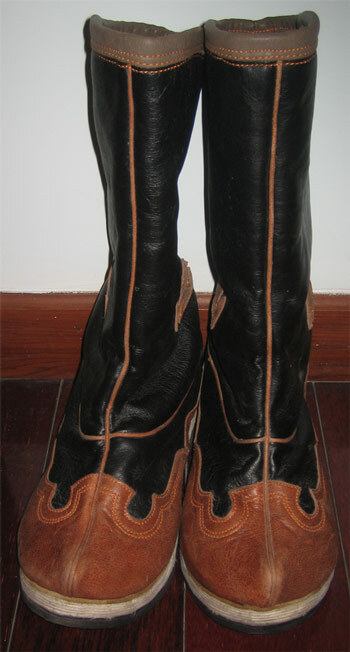 The reason is that the nomads of Mongolia quite look down upon this type of footwear. The Mongolian word for ‘shoe’ (including cloth shoes, slippers and sandals) is шаахай shaakhai. Indeed, one of the pejorative names the Mongolians have for the Chinese features this very word: шаахайтнууд shaakhaitnuud, or ‘shoe-wearers’. The proud Mongol wears proper boots; only the lowly Chinese wear cloth shoes. I suspect that this name dates back at least to the Qing dynasty, when Chinese were allowed into Mongolia for part of the year for the purpose of agriculture and trading. (For some background on trading during the Qing, see the Wikipedia article Mongolia during Qing rule). They were not, however, allowed to settle permanently. At the end of the dynasty, the Qing court decided that it needed to consolidate its control of Mongolia by settling it with large numbers of these ‘shoe wearers’, a policy which provoked strong opposition from the Mongols. This led the Mongols to rebel and finally expel the Manchus in 1911, very shortly before the Manchus themselves were overthrown in China (see Wikipedia). A wariness at the possibility of large populations of Chinese becoming established in Mongolia continues to this day, and is one reason behind the strong anti-Chinese stance of most Mongolians. So I will be wearing my cloth shoes on occasion (except when it rains), although the naïve pleasure of adopting small elements of the local culture will be spoiled a little by my consciousness of what the ancestors of the founders of Khanbaliq think of them. If worst comes to worst, I can make self-deprecating little jokes about having joined the ‘shaakhaitnuud‘. And I still have my Mongolian boots. In Brazil many call them “kung-fu shoes” (…well, at least “many” in my circles). They’re popular with martial arts aficionados. I’ve also seen them described as “Chinese sapatilhas”, a word used for ballet shoes and such. I’ve edited the post a little to include ‘kung fu shoes’ as the English term, since this appears to be a widespread usage.